This is a recipe I made last week Tuesday in a rush so I could have some dinner after class. I prepped it by 2pm and then when I was home at 6pm I threw it in the oven. It turned over quite good. It was a little dry, so I added a little bit of an herb oil I made when I served it and then it was just perfect. Prepare as much pasta as you would like in a medium sauce pan, as directed by the package. When finished, drain and set aside. In a large skillet, heat 1 tbsp oil and add the diced chicken. Once all sides of the chicken are white, add the remaining oil and broccoli. You can also add the balsamic vinegar. Sadly, the vinegar is acidic so it turns the broccoli and dull green-brown color. If I were cooking for appearance I would omit it all together, but I cook for taste. Cook the mixture until the chicken reaches 165F. Turn off the heat and add the cooked pasta. Stir to mix well. Heat the oven to 350F and spray a large casserole dish. Put the mixture into the casserole dish. 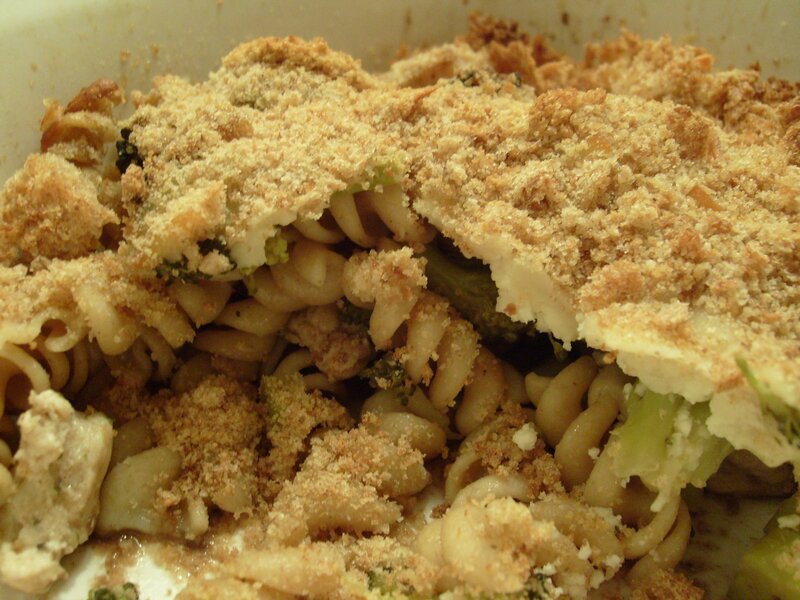 Top with cheese and breadcrumbs. Cook in the oven for 25 minutes, or until the top is golden. 1. Heat a large skilled to medium. Add the ground turkey and onion and cook for 3 minutes, breaking up the meat while you cook it. Add in the parsley, paprika, salt and all-spice and continue to cook for 3 more minutes. Add the chopped peppers and cook until the meat is browned. 2. Add the pasta sauce and brown rice to the mixture. Continue to cook over medium heat for 3-5 more minutes. 3. Remove from heat and add Parmesan cheese. Heat the oven to 450F. Do not cut up the peppers but cook the rest of the mixture as directed. You will need at least 4 more peppers for this recipe. Cut off the tops of the peppers and discard the seeds and membrane. Do not throw out the top – reserve for later. Place peppers in the microwave for 2 minutes so they are still slightly crisp, but a little tender. Let cool. Place about ¾ cup of the cooked beef mixture into each pepper and place each pepper into a sprayed baking dish. Cover with foil and bake for 20 minutes. Remove the foil and bake for 5 more minutes, or until lightly browned. Garnish with the reserved pepper tops. 2. Combine the first 5 ingredients in a medium bowl and whisk. 3. Combine flour, baking powder and salt into a large bowl and mix well. Cut in butter with a pastry blender, 2 knives, or your hands until a coarse meal is formed. Add berries and almonds and stir well. 4. 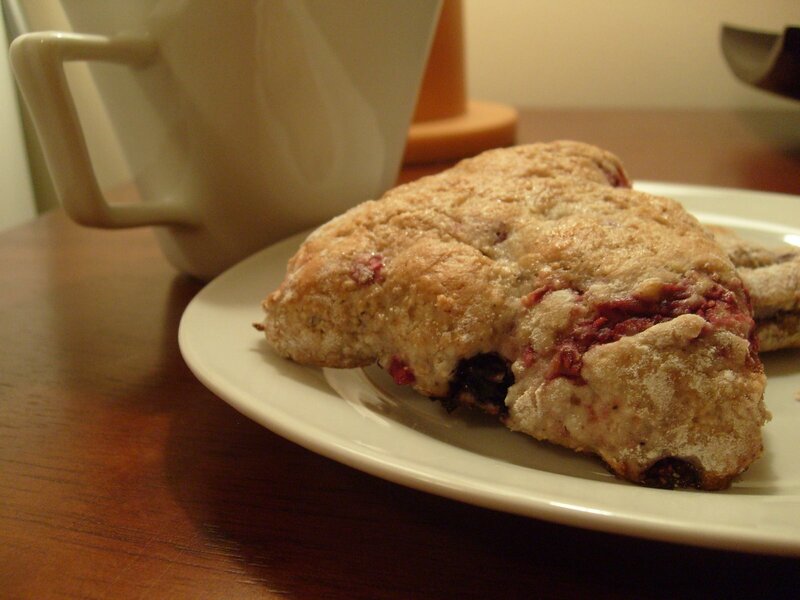 Add the milk mixture to the berry-flour mixture and stir until the dough is just moist – it will be sticky! 5. Turn the dough onto a well-floured surface. With flour on your hands, pat into an 8-10 inch circle. Cut into about 12 wedges. With floured hands, transfer each wedge to the baking pan. 6. Coat the dough with egg white and sprinkle with sugar. 7. Bake for 18 minutes, or until golden brown. Serve warm.